I'm very aware that the time between school and dinner can be a tough time, and one that can be easily wasted. Nothing is easier for me than letting the kids come home, putting on the TV, letting them fill their faces with snacks and act like vegetables whilst I get jobs done, like the washing or cooking dinner. I don't like it like that though, I want my children to remember doing things with me. I'm very lucky to be able to pick them up each day and don't want to waste that time with them. But in the winter months it can be harder to think of things to do together. They do love helping with making tea though. One thing I've really wanted to try since having the new kitchen is making pasta. I have made it in the past but not for many years, mainly because we've not had the space. Worktop in the old kitchen was limited and even the table in the dinning room was hard as it was oval so difficult to roll the pasta out. I've never done it with the kids so it's at least 7 years since I last did it. My wife had threatened to chuck out the pasta roller, and I could understand it from all those years of collecting dust in the cupboard. I had always planned to do it with the kids and no better time now the kitchen is much bigger! So last night, with my eldest at a party, I decided to make some pasta with the younger two. I sent my daughter off to get some fresh eggs, luckily the chickens had laid just the number we needed and she burst in shouting "They've laid FOUR!!!" Pasta is so simple to make, I couldn't believe I'd left it so long since the last time. Nothing else added, except elbow grease and that was provided by the children. I set them mixing the dough and working it. They both laughed lots and loved getting their hands dirty in the bowl. 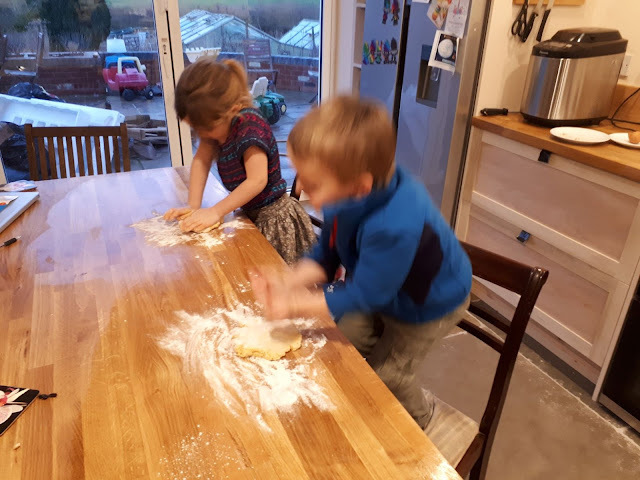 When the dough was formed I had a bit of trouble to stop them making pirate ship shapes from it and they soon got into the swing of knocking it around, they've done it lots with bread so I wasn't surprised they liked doing it. I put some washing on the airer whilst they were doing this and then came back and gave it a final kneed before wrapping it and popping it in the fridge for half an hour. Then came the really fun bit, rolling it out. 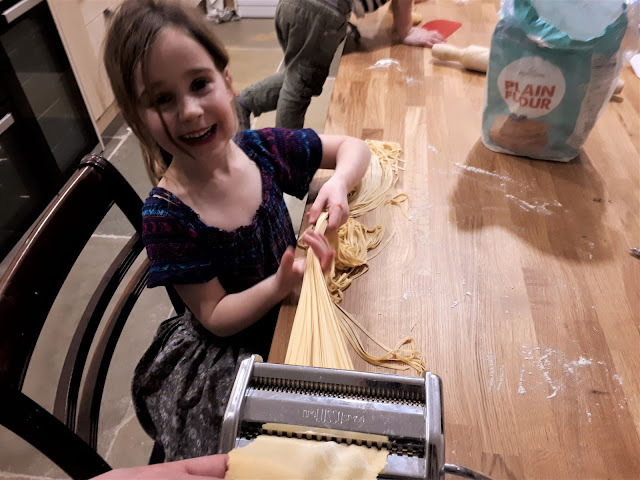 The old pasta machine I have cost me £2 about 15 years ago, at that money I couldn't turn it down, it hasn't done huge amounts in that time though, but it was worth it just for the smile on my daughters face! She laughed the whole time we rolled out the dough. Telling me it was like really long hair as we rolled it through. She couldn't quite believe that we had just made pasta from scratch. As soon as her mum and sister got home she rushed up to tell them, and was just as proud as punch! We cooked it very quickly in boiling water (under 2 minutes) and had it with some mixed bean chilli I had left over. It tasted amazing, soft and silky. I'm so keen to teach my children where their food comes from and to inspire the passion I have for it! 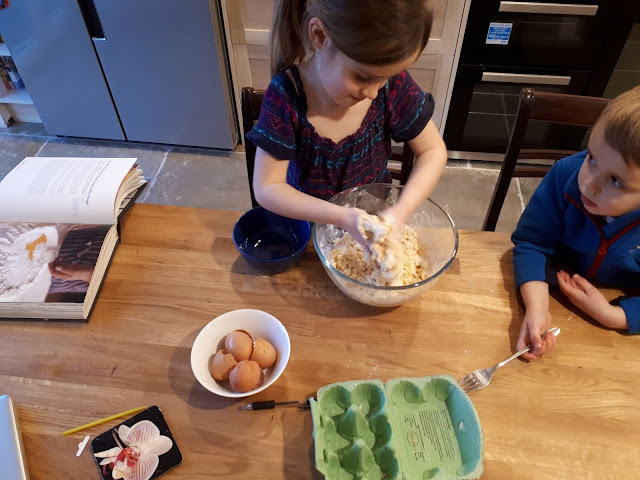 My eldest seemed more jealous about making pasta than my middle daughter was about not going to the party. We got some cook books out the next morning and went through them to see what else we could make. A crinkled pasta cutter was high on their list so that ravioli could be made in the future, but maybe tortellini next week instead? Anyone else make their own pasta? What is your favourite pasta? What else would you do with the time between school and dinner? Cheers Peg. they love it if they can see the point in doing a job - and no greater point than food! Hopefully they'll have a good set of skills when they're older! isn't it amazing how much fun kids can have doing useful things? if their parents enjoy it, chances are good they will enjoy it too! we do make our own pasta often. They really love it don't they! I think we were all smiling all evening to be honest, my daughter was in her element. The boy was a bit tired but still had fun, especially when I kept slapping the dough on his hands! We have homemade past here about twice a week. 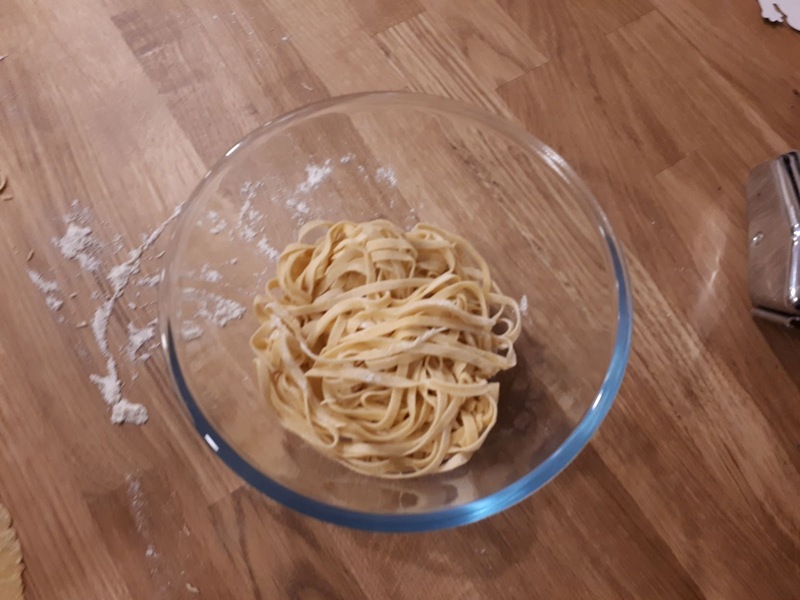 With the Kitchen Aid mixer and pasta attachment is SO easy to have something fresh for dinner - in the time it takes to heat the pasta topping and boil water I have the egg noodle dough made and through the rollers. Store bought pasta is so plastic-y and gross in comparison that we can no longer eat it. I've also found that making balls of pasta and freezing them is an eggcelent (sorry) way of saving eggs in the spring when there is a glut. You can bring a ball of frozen pasta out in the morning and it's ready to be cut and boiled by lunch. I was going to see if my bread maker could knock the dough together, but the kids like that bit at the moment. Quite hard to get it back from them at times! I love the idea of freezing it when we have a glut of eggs. But then I guess that if I made some and dried it that is also a way of preserving them? I do make my own but only with a regular wooden roller, no pasta machine yet. I like a bit of salt with mine. Like you I forget how easy it is until I do it again. The smile of your daughters face is priceless! She laughed the whole time! Anything where she is helping she is happy! The pasta machine was so cheap all those years ago. Fairly sure I was still living with mum and dad at the time! That's how long ago it was! That's a great idea! 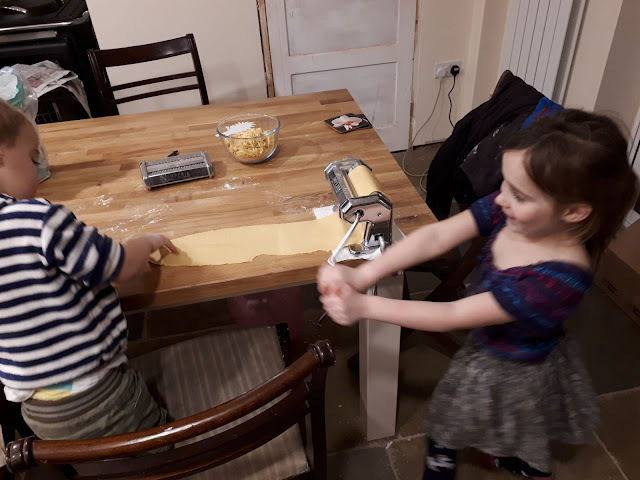 Last night they all got the playdough out and were practicing their pasta shapes, making tortellini and ravioli to show me. Could be lots of evenings of fun here to be honest! Just need the chickens to up their laying to keep up with all we've been making lately! I agree that the smiles are worth more than money! Cherish them. You can (and should) learn to make ravioli without any special tools. Just roll out the dough through the machine, put little balls of filling spaced like checkerboard spacing, then wet the intersections and lay on a topper. Gently press it down and cut the pieces apart. Air dry a few minutes and boiling water bath. Delish! (Rember, Mrs Inman was a foodie!) AND! As a wood worker, you might want to fire up your lathe someday and turn out a ravioli roller! A ravioli roller looks a fun projects! Maybe when the house is finished though! We found a crinkle cutter in the playdough so they might just use that if we make ravioli next week. what filling would you recommend? One daughter doesn't like mushrooms so that's out unfortunately! I think they're going to love making them! Really, whatever you like! I'm more into meat/sausage fillings. My wife preferred cheese. So....? Just make some! I used to make my own pasta - it is quite simple, really. Now that the kids are grown, it's just easier to buy a box! Love the smiles!! Yeah, we get through a lot of pasta so no way is it going to replace the stuff we buy but it might make a few fun meals if we make some here now and again. I'm like you in that I haven't made pasta in too long a time. (May I borrow your children?) I even picked up a second-hand pasta maker a few years ago but have yet to use it. Shame on me. Your post may have just pushed me to learning how to use the roller. Children learn by doing and yours are blessed to have a dad like you. Nothing wrong with child labour in that way. In fact I'd go so far as to say that's what's wrong now, people think kids should be playing all the time, they want to help! 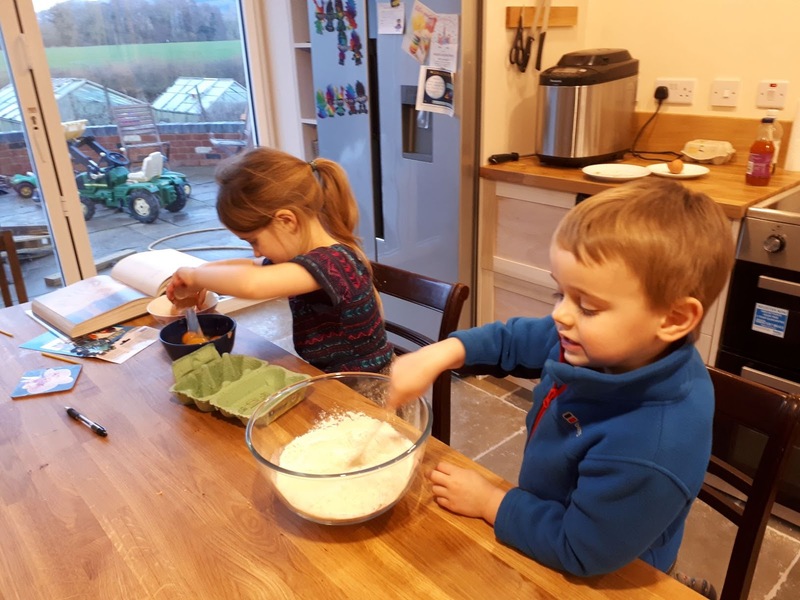 I hope my kids pick up lots of skills, but if they don't I think they'll learn that they are practical enough to try anything and everything is worth trying at least once! Lovely post would the young ones like chopping veggies for soup or making crumble over fruit. Do you have knitting Nancy in uk. You could make one and the children can make coasters.for Gran ma other ideas are drawings stuck on cardboard cut up for puzzles maybe presents sewing up cushion covers napkin rings. From clay dried in oven maybe google easy activities for children. We got a wii for grandsons for winter instead of tv. Your girls may like cheap books with cut out paper dolls win dresses you colour or you draw and cut out some your self. Hope that helps love all your walk nana Marie in Australia. I get the kids to peal and chop the veg at least a few nights a week, they love it! And they've started knitting and sewing which they love! Finding easy things for them to make is harder though, I like the idea of the coasters. They do some type of craft most nights, normally involving cutting out, sewing or playdough! They even do it before school sometimes! As for the computer games I'm trying to keep them away from at the moment but I know it won't last! Getting some clay is a great idea though, there is a pottery club at school but at 80 mquid a half term it's a bit expensive for us at the moment, maybe we could do something like that at home instead. Sure I could make up a potters wheel given a few hours! Thanks for you comment! Some great ideas to think about!